We left Nashville on Wednesday around 7:30PM CT, got to Mom and Dad's around midnight ET, and went directly to bed, do not pass Go, do not collect $200. The following morning, Dad and I went to the local Kroger, where we loaded up on supplies - as a side note, because my father shops at this store all the time, and they know him well, we got some of the best customer service I've ever seen - kudos, Kroger located on Hwy 120! We went back to the house, loaded up Matt, Lola and Maggie and headed north to the cabin. Thursday was a mix of unloading the car and unwinding - Matt and I took a swim in the waterfall, tooled around on the Rhino and then we had a great dinner - pork chops, turnip greens, and some cowboy beans. We watched a little TV and then slept like logs. Friday, we spent time playing with the dogs, visiting with neighbors, and riding the Rhino - this was the first of my two attempts at self-mutilation. We're on the Rhino, a branch snags the rollcage and snaps back, whipping me in the arm. It hurt like hell. As a result, I now have a large bruise that looks like Haley's Comet on my right arm. Mom came up after volunteering at the Peachtree Road Race, and we barbecued a few chickens for dinner - we watched fireworks on TV -which isn't as good as the real thing, but since we can see the fireworks that the Sounds do on the weekends, it's not like we felt deprived. On Saturday, I went to the annual meeting for all the members who own cabins on the mountain - the highlight of which is that I've been named the new head of the Social Committee. Good thing, too - later that night, we held the annual July social in the field in front of our cabin. A potluck with lots of chicken dishes. Note to self - next year, do something that isn't chicken. Mom's cupcakes were a hit, though. My second act of self-mutilation occurred just before the party - Matt and I went for another swim in the waterfall, and I misjudged the spot where I opted to slip into the water - there is a deep hole in one section that is bisected, several feet below the surface, by a large wedge of rock. I hit my shin on said rock and howled in pain for several minutes. The good news is, if you're injured, being in cold mountain water helps the swelling. At present, I have about a two inch scar on my shin, surrounded by a large bruise. I've read that left-handed people live shorter lives than righties, due in large part to accidents - I wouldn't doubt it based on my experiences this weekend. We headed back to my parents' house Sunday. I drove Dad back in his Jeep, as we had to stop and pick up a knife he had left to have a new sheath made for. 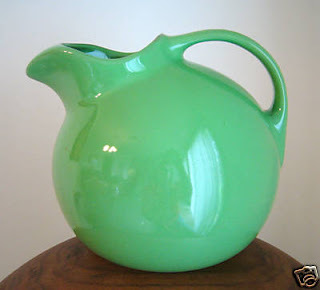 This is a Ball Pitcher from the Hall China Company - circa 1936. Growing up, my father had one that was spearmint green in color that his mother used for iced tea - he has it now and uses it for iced tea. I got one for Christmas a few years back in shell pink, and I love it. This one is sort of jade/emerald green, and it's in perfect condition. She wanted $65 for it - and not being a haggler, I paid it. Worth every penny. When I walked back to the knife shop to show Dad, he had a fit. Hall now makes repros of them - in white and cobalt blue (I gave Laura a blue one for her birthday a few years ago), but the originals are much harder to find. I don't know what it is exactly about these pitchers that I love so much - but I find them really esthetically pleasing as well as functional - the lip is designed to keep ice from splashing into your glass when poured. My new purchase is currently on the mantle til I find a permanent home. Last night, upon returning to Nashvegas, I started a big load of laundry, then we chilled - both literally (I iced down my shin) and figuratively (we started Hot Fuzz, which arrived via Netflix in our absence). So that's that - now I'm easing my way back into everything I walked away from Wednesday night. It's not pretty, but as Dad would say, "That's why they pay you."